"The various moods of the Grand Tetons make them enticing to watch but a real challenge to paint. I have done on-the-spot sketches of the mountains at the same location, looking in the same direction, at different times of the day and had the paintings bear little resemblance to one another. Such surprises are a powerful reminder of how important light is in establishing the mood and the overall ambience of a scene." Teton Valley copyright© 1997 by G. Harvey is prohibited from being copied. 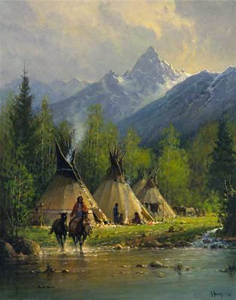 G. Harvey art, western, native Americans, Indians, teepees, artwork, art work, canvases, images, paintings, pictures, and prints of Teton Valley by artist G. Harvey for sale. 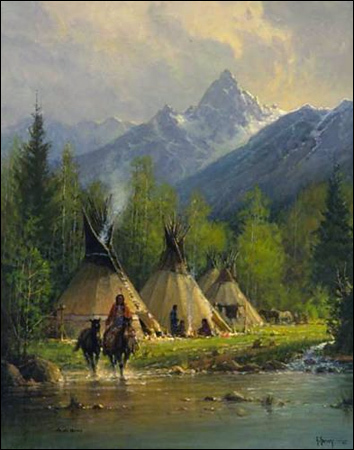 Teton Valley painting by artist G. Harvey can be purchased in art print or canvas form at special sale prices at Christ-Centered Art.